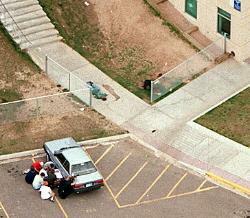 Last April 20th [Hitler's birthday], it was the first anniversary of the Columbine High School (Littleton, CO) tragedy. And what have we learned? Nothing, as usual. One might argue this is perfectly normal, since the public never learns anything. Two teenagers armed with guns and homemade pipe bombs killed 12 students and teachers before taking their own lives. The event, as you know, was felt around the globe, and is still much talked about. In this three-part series, I intend to discuss the alleged causes and problems, as well as the real causes and problems, surrounding Columbine and other killings of this type. The teenage killers thought that they would inspire a cult following and "kick-start a revolution." Apparently they were not followed much: a school in Colorado had to close under the fear of threats, and so did three others. In terms of effect on their peers, Harris and Klebold failed. But what is distressing is that the event failed even more to make people aware of the importance of gun protection. The bulk of the enforced solutions are just more zero-tolerance nonsense, of which I have talked about before in Gotta ban 'em all! The shooting has been, and continues to be, used as the perfect excuse to viciously attack student rights. Just one day after the event, a senior who brought a knife to school to cut apples for his lunch got arrested, kicked into a juvenile detention center, and suspended. A couple days later, teachers sued a student for having a web site on Satanism, which included their names. The same thing happened to two students in Ohio who had a Goth web site. A school in Florida banned the presentation of a Woody Allen play, which ironically only made the students who worked so hard on it very angry about the arbitrary and censoring decision. But not only individuals are attacked. In Delaware and in the Philadelphia suburbs, dozens of teenagers have been locked-up on charges of "threatening behaviour." Schools attack dress and speech regularly, especially trenchcoats, but even silly things like hair colour (a boy got suspended for having a streak of blue hair), and use metal detectors on the students' entry. Congressmen fight relentlessly against violent speech, for Internet filtering and for prayer in schools. Kids get ostracised and arrested for joke-threats. These and other events have caused some observers to call the public reaction a total "hysteria." Mark Goodman, executive director for the Student Press Law Center, has his own opinion on the crackdown. "The idea that a student with blue hair is a security risk is ludicrous. Administrators want robots. They want a world with no conflict, no individuality, no disagreement." This is fairly enlightening on the atrocity of our current socialist education. Companies jumped the bandwagon and attempt to offer services to help detect "trouble cases." Here is a page from E&E Consulting detailing their criteria for typical killers. Funnily enough, I fulfil 10 out of these 11 criteria (and I think most people do), despite never having committed a crime. Not only that, but I'm planning to acquire a gun. Watch out people, I'm an armed madman! And wherever there is a bandwagon of popularity, you can be sure the government is going to follow. And since liberals have been using children for years to push their agenda, what do you think Clinton did? Why, three months after Columbine, he met with eager Columbine High School students who asked for nothing more than encourage him. "Don’t allow the victims of Columbine to have died in vain. We must not lose the urgency of our mission," Clinton said. During the one-year anniversary of Columbine, Clinton also said that Americans "must continue to honour their memory and your courage by resolving to make America a safer place for all our children." And how do we make America safe, in the minds of liberals? Why, make our children defenseless, of course. There are many problems with this way of thinking, most of which are obvious. But what is the most blatant is that Columbine High School has refused to allow guns for years! Of course, that did not prevent two children from going on a violent rampage. That may seem obvious to you (it sure does to me), but it is far from obvious to lawmakers. And as one of the killers, Eric Harris, said, if they didn't find guns "[they] would have found something else." Now, don't get the wrong idea: I'm not saying guns should be unregulated. Like any other action in society, it must be subject to the protection of our rights. In this view, I do approve of the Brady Bill (background checks on buyers), and 69,000 handgun sales were successfully stopped in 1997 thanks to this law. Not that it should have much effect, since all you need is a sucker to buy a gun for you, or find another weapon, but the essence of the law is just -- a justice that is sorely lacking in our society. Studies show that by simply enforcing the just laws we already have, we can considerably reduce gun crime while keeping our constitutional freedoms. In Boston, with these measures (such as a 10 year penalty for felons found to be in possession of a firearm), youth gun-homicide was reduced to zero in 1996 and 1997. Youth violence has also been successfully reduced in various cities with similar measures, but without adding any new gun laws. What's worse, California saw reductions in homicide rates from 1991 to 1998 significantly higher than country average, without implementing any new gun law at all. But it's when we start on the path of impulsive governmental gun-grabbing that it makes no sense. Why take away guns from honest citizens, even if they are young? Is the solution to stop killings, to prevent the future victims from defending themselves? That is surely an absurdity of the highest order! As I have reported before, the Dunblane killings, in Scotland, saw the parents of the victims eager to do the same. The children of Columbine were also eager to support Clinton in his assaults on our lives. The first question one might ask him is, do these people have any heart at all? Are all these people depraved or lying criminals, and just waiting for the occasion to show their true colours? That would be a rather irrational conclusion, since there is no reason to believe that these people are all depraved or liars; therefore, we should assume that they truly believe what they are saying and advocating. In the case of children, we may say they do not know what they speak of, but parents and politicians do not have that convenient excuse. So what impulse pushes people to be that way? One more likely hypothesis is that it is linked to violence in general. People may possibly equate guns with violence, since guns are prominently used in violent acts. Furthermore guns are associated to conservatism, totalitarism, and such. Therefore it is not difficult to understand why they are a very negative symbol for some people. A good hint that this link is correct is that the more gun violence people learn about, the more they seem to actively reject guns, paradoxically. There seems to be an inescapable proportionality here. My personal hypothesis is that it is probably a twist of our self-preservation instincts. Whatever causes it, it is some kind of stupid naiveté that seems to overpower all common sense. In honour of the Columbine killings and the aftermath, I propose we call it Columbine innocence. It seems to be primordial to study it in order to counter it, because it has very serious consequences in societal terms. Intolerance towards gun ownership is constantly on the rise in our governments and more control is forthcoming, fuelled by Columbine and other incidents. And as long as this tendency persists, we will celebrate a lot more Columbines. Read the second part of this series, Video Game Killers, which discusses the attitude of the media, as well as some more plausible problem-solving threads.